I went from "eww, carrot cake" to "oh my god, carrot cake!!" because of Serendipity 3. Of course there was a wait, as there has been one the last eight years. The place was tiny and a little cramped ("cozy" is pushing it), and nowhere near as romantic as it looked in the movie. Most tables had an order of their "famous" (major emphasis on the air quotes) Frozen Hot Chocolate, which I'm still convinced is a pimped out version of Swiss Miss. But the carrot cake was a different story. So on the menu it was called Celestial Carrot Cake, and that's either a reference to the price ($8/slice) or how it's so good it sends you to the moon. 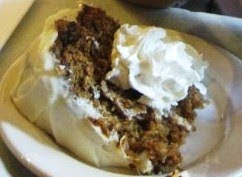 Insanely moist and with a generous serving of whipped cream and walnuts, the texture was soft, chewy, perfect. Whipped cream was slightly overkill for me so instead I attacked the cream cheese icing it was smothered with. About three or four bites into it, I was a convert. Other CC haunts in NYC (so I hear) are Carrot Top Pastries and Billy's Bakery. Care to add more? I didn't know you had a blog Jen! i'm officially a fan! if you know any vegan desserts gimme a heads up. Sure, are you vegan? I own Veganomicon, which is a great book. I highly recommend it. Also, I wanted to tell you about two chocolate companies you may already know of: Michel Cluizel, and Vosges. TOP NOTCH. I had one piece of the Peruvian (of the former company) last night and almost died of pleasure. so NOT a Vegan but i figure you're a healthy-livin lady and might know some. i'm just curious.. I want to look into raw desserts too. Vosges I know of for the bacon bar.. which I have yet to try! Thanks lady, will look them up. Especially this Peruvian..